The Watergate gas station was once described as the most expensive gas station in the world. 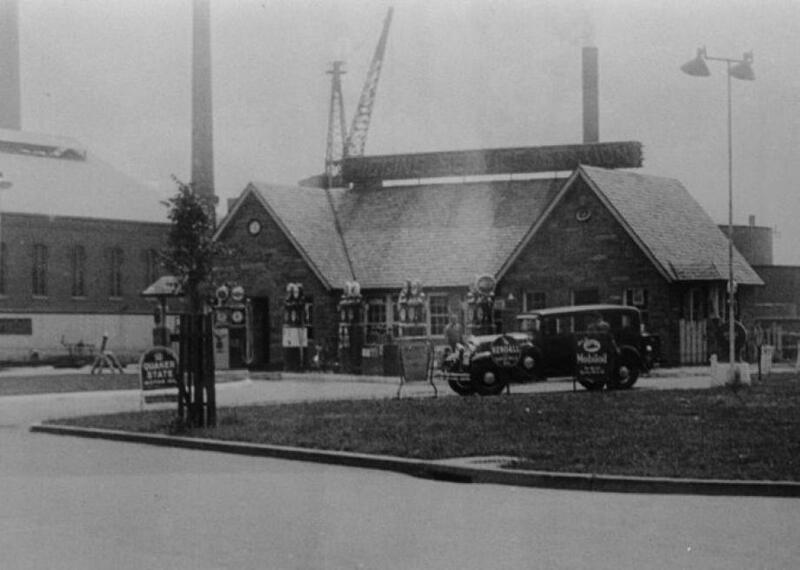 View of the Higgins Service Station circa 1935. Ever drive past the seemingly out of place gas station next to the Watergate hotel? That’s the old 1932 Higgins Service Station, more widely known in later years as the Watergate Exxon. (Today it is a Valero gas station.) It is one of Washington, D.C.’s most iconic gas stations. Gas stations were an entirely new building type at the turn of the century, and oil companies were still experimenting with which architectural styles best suited their business. Two competing approaches emerged early on: classical and domestic. The neighborhood around the Higgins Service Station was very different before construction of the monumental Kennedy Center and Watergate Hotel complex, dominated by industrial buildings. Ownership of the Higgins Service Station passed through three families until it was swallowed up by Exxon sometime after 1992. There is another interesting story about the modern Exxon station and how it acquired a nationally known, horrible reputation. According to Freakonomics, “There’s a gas station near the Watergate Hotel in Washington, D.C. that famously sells very expensive gas. Reporters flock there for the standard sky-high gas price story, and residents have long suspected that the station doesn’t actually want to sell gas.” Jump over to Yelp or Google Reviews and take a look at some of the reviews the Waterfront Exxon has received. It used to be known for charging 50 cents to a dollar more per gallon than the Sunoco station directly across the street. It turns out that the crazy high prices were the result of a “mortal struggle” between the owner of the station and the company that had a contract to operate it. A complex set of incentives meant that it was in the operator’s best interest to minimize the amount of gas sold and focus on their auto repair business. You can read more about the gas war in this NPR investigation. The Watergate Exxon closed in 2012 and reopened the next year as a Valero under a different operator. Gas prices have normalized.